It seems that you may have a replica of the 1855 Blake & Co. $20 gold piece. Gorham Blake was one of the enterprising individuals that during the gold rush period in California made a living assaying gold. 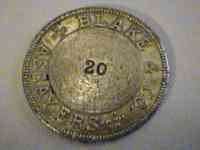 Though other assayers made private issue coins to take up the slack from the repeated closures of the San Francisco branch mint, Blake’s company never really was able to create a circulating medium. The “coin” you have is most likely a replica since only one of the $20 Blake & Co issue is thought to exist. The Blake replicas are modern twentieth century copies.